For better or for worse, Cinco de Mayo — like Saint Patrick’s Day — has become one of what NPR writer Linton Weeks calls America’s “Alcoholidays”: those holidays that have become “widely celebrated by people who have no ties to the traditions they spring from” through the festive adoption of national colors and costumes, and the excessive consumption of national alcoholic beverages. Think about it. What would Saint Patrick’s Day in America be without the least Irish of us parading about in green while swilling Irish whiskey and chasing it with dyed beer? What would Cinco de Mayo in America be without the least Mexican of us shooting tequila while sporting a sombrero? Everyone has an opinion about whether the “mainstreaming” of such holidays is a good thing or bad thing, but I’ll leave that discussion for another day. Spending this Cinco de Mayo in France, the big question for me today (putting aside my “least Mexican”-ness) was whether I could — or should — be celebrating it here … in FRANCE. I’d wager that most Americans who are off imbibing great quantities of José Cuervo today haven’t the foggiest idea what they’re commemorating. Contrary to popular misconception, Cinco de Mayo is not Mexican Independence Day. That’s September 16, the day when Miguel Hidalgo y Costilla, a Roman Catholic priest in the town of Dolores, announced the beginning of the Mexican War of Independence in 1810 (“El Grito de Dolores” or “El Grito de la Independencia“). On the other hand, Cinco de Mayo marks the anniversary of the Battle of Puebla in 1862, when the Mexican Army defeated a superior force of French soldiers. Wait … the French? The French were in Mexico? 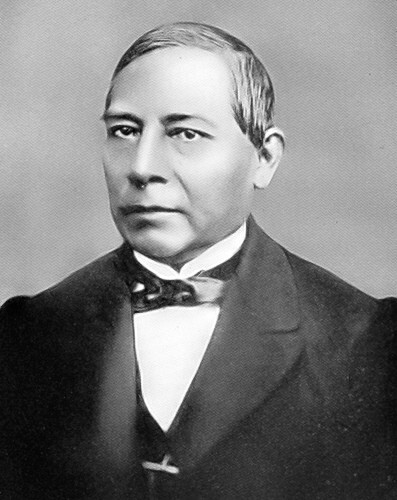 In 1861, the President of Mexico Benito Juárez suspended all foreign debt payments because the Mexican Civil War of 1858 and the ensuing Reform Wars of 1860 had almost bankrupted the country. Mexico’s European creditors were none too pleased though, and Spain, Britain, and France sent naval forces to Veracruz to strong-arm Juárez into an agreement. Spain and Britain negotiated and withdrew, but the French — under Napoléon III, one of the biggest jerks of the 19th Century — decided to stay. As it turns out, Napoléon had used the Mexican debt crisis as a ruse to initiate a military operation there. He had some wild-eyed plan to establish a sprawling Mexican Empire in Latin America under French suzerainty, and the plan even involved something they called “the Cactus Throne.” Seriously. The guy was a bit of a megalomaniac. To bring this plan to fruition, the French army left Veracruz and marched on Mexico City. On May 5 near the town of Puebla, the French army attacked the remnants of the Mexican army, ill-equipped and half their size. To everyone’s shock, the underdog Mexican forces crushed what was then touted as the best army in the world, delivering the French their first significant military defeat since Waterloo. That night, the victorious Mexican forces celebrated by singing La Marseillaise within earshot of the remnants of the French army. In the end, the Mexican Republic didn’t survive the French invasion. The French seized Mexico City a year later and installed Maximilian I as Emperor of Mexico on that ridiculous Cactus Throne. (He was Napoléon’s cousin, by the way.) The Battle of Puebla, however, assumed mythic power for those in the Mexican resistance, and Napoléon’s Latin American pipe dream came to a rude awakening just a few years later. Considering this history, I initially supposed that celebrating Cinco de Mayo here in France might not go over very well. It would be kind of like celebrating the Seventh of October if I lived in England, right? Yeah, the Seventh of October. You know … October 7, 1777 … the Battle of Saratoga. SARA … TOGA … the battle where we beat the British and turned the tide of … oh, never mind. You’re right. If I celebrated the Seventh of October in England with an American flag and a Bud Light, I wouldn’t be stepping on anyone’s toes. I’d be lucky if anyone even asked me what I was drinking to. I suppose the same is true here in France today. Author’s footnote — Part of Napoleon’s grand scheme for the Americas was to weaken the United States’s influence in the region to make room for his own. That’s one reason he tacitly supported the Confederacy during the early years of the American Civil War. It’s hard to measure the impact that the French defeat at Puebla had on the outcome of the Civil War, but it’s undeniable that French support for the Confederacy waned afterwards and the French alliance long hoped for by the Confederacy never materialized. 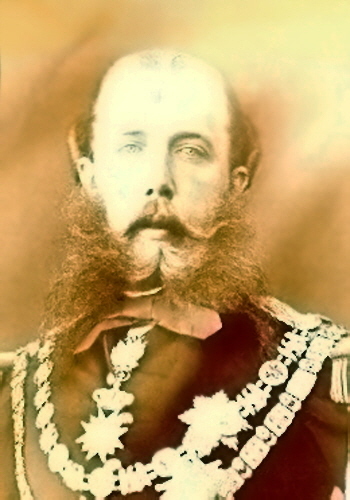 The French imperial adventure in Mexico also fueled support for the Mexican resistance within the Union. 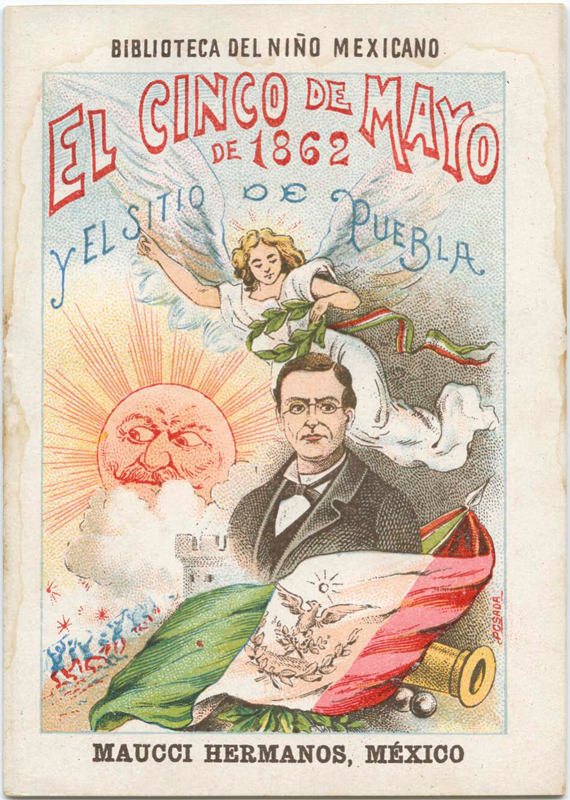 It has been noted that Mexicans and Americans in California jointly commemorated the first anniversary of Cinco de Mayo in 1863 by raising money and recruiting soldiers to aid in Juarez’s resistance against the French. That may not explain the irony that Cinco de Mayo isn’t a Mexican holiday, but it may help explain why Cinco de Mayo is a Mexican-American one. Excellent post, thanks so much. So interesting, and almost ALL of it is new to me. 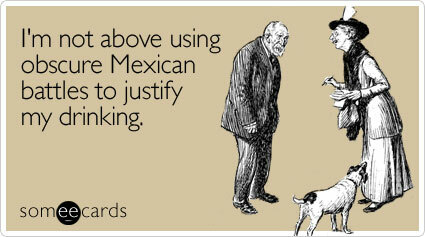 I nver even bothered to look to see what Cinco de Mayo really was. But you have cleared it up beautifully.